What measures will you implement to reduce the waiting lists (now over 18 months) for what our health care system labels as “elective” surgeries like knee and hip replacement? Currently in BC, it is illegal for private individuals or groups to offer care outside the public healthcare system, and as you have pointed out, our government spends our tax dollars on legal challenges to these private options. The Canada Health Act is supposed to ensure access to care for all Canadians, so how the province can morally or legally justify limiting access to care in this way, I do not know. But the answer is simple: allow private clinics and hospitals to operate. Let them charge patients directly for the services they provide. Will you implement these within the first 100 days of being elected? What metric will you use to indicate the success of your measures? Average wait times for each procedure, both in the public and private systems. I am confident both will go down dramatically, as the private care takes pressure off the public system. 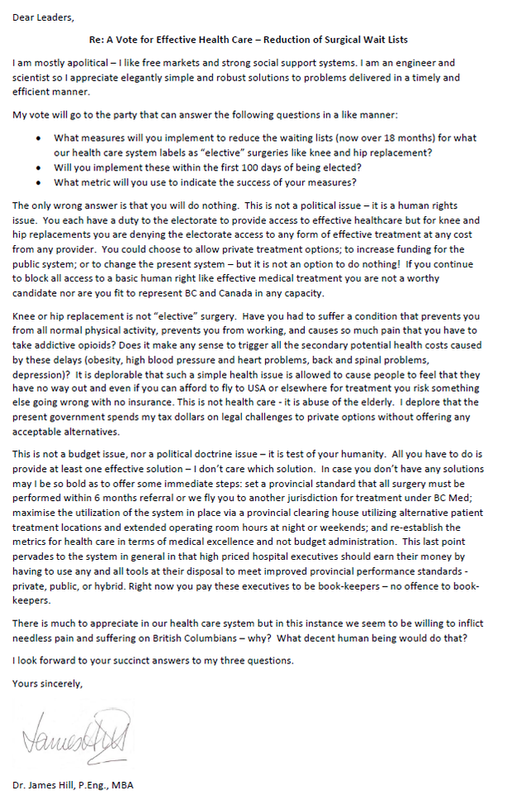 My political opponents, if they bother to address this issue at all (I will push them to do so if I have the opportunity to debate them on this topic), will likely decry my proposed solution as advocating for “2 tier healthcare”. This phrase has been used to shut down debate on healthcare reform for as long as I have been listening to the conversation. The simplistic black and white thinking that it represents have done the citizens of BC no good. We continue to spend more on healthcare than anything else, and yet wait times for various treatments lengthen, and critical care struggles to keep up with demand, as evidenced by the recent deaths in ER waiting rooms. We need a frank discussion on healthcare reform, and I hope that your letter will spark this discussion. As you have rightly pointed out, this is a human rights issue. Those in power that would defend the status quo should be able to tell citizens like your wife “I believe you should not have the right to seek private care, even if you are willing to pay for it yourself because…” With a little consideration, anyone can see that there is no morally justifiable end to this statement that respects the rights of individuals in a free society. The BC Libertarian Party was founded in 1986 to advocate for individual liberty, low taxes, free markets and social tolerance. We believe that all citizens should be free to seek their own interests, so long as they never harm another person while doing so. We also uphold that free economies lead to prosperity. Towards this ends, the only proper role of government is to protect our life, liberty, and right to pursue happiness. Authorized by the BC Libertarian Party, (604) 944-2845.